A vision examination is a very important step in preparing children for that first day of school. During the school years, good vision is essential to the ability to read and to learn. Preschool vision issues need to be detected and treated before they lead to a learning and/or behavior problem. If the pre-school or kindergarten offers a free vision screening, parents should be aware that the screening might be incomplete. Many free school vision screenings do not test important visual skills, including eye teaming (binocular vision). 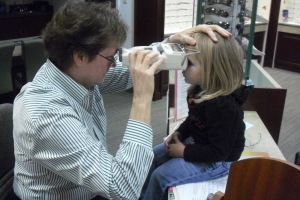 Children need a comprehensive preschool vision examination.